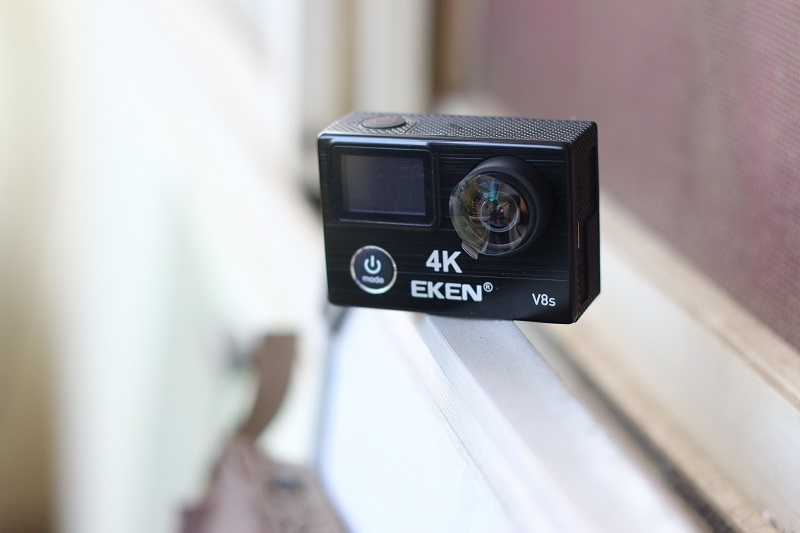 We love Eken Action Cameras for their remarkable performance at an affordable price. 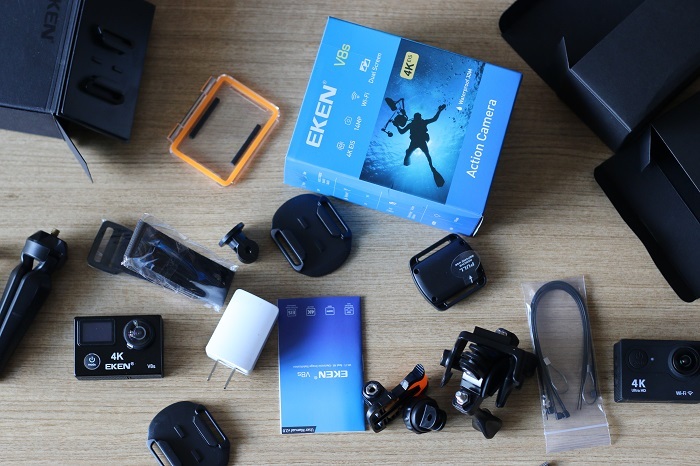 After our review of the Eken H9, we are following up with the Eken V8s Action Camera Review. The Eken V8s is in the premium category when compared with the Eken H9. So, a direct comparison will not make much sense. 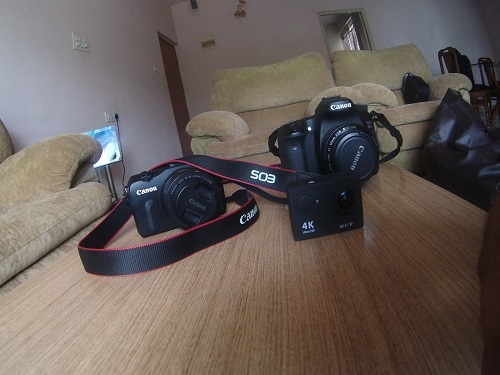 However, since we own both of these cameras, let’s do a side by side comparison. As you can see, the 4k @ 25 fps mode is achieved by upscaling, since the image processor only supports up to 1080p. 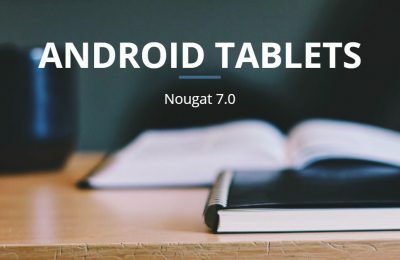 The build quality also has vastly improved with brushed aluminum construction on the front if this device. 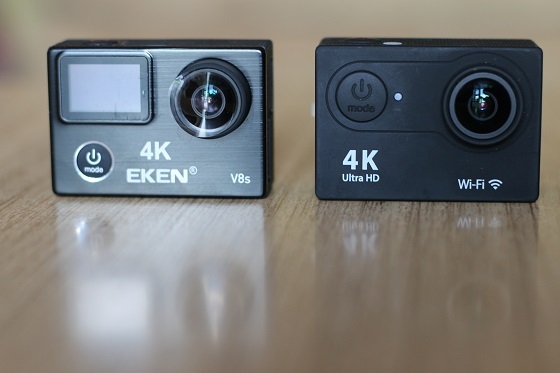 The rear side looks identical when compared to other Eken action cameras. But, in case of the V8s, Eken has used a brighter OLED screen with a resolution of 320 x 240 pixels. On the accessories front, Eken is always generous to provide a wide variety of photo gear. The accessories provided are also fully compatible with a GoPro which should come in handy to many. If you think that the accessories that are provided in the box are random, then you would be wrong. Eken has put a lot of thought into this and carefully choose all the items with specific use-cases. However, the Wall charger is new for us. 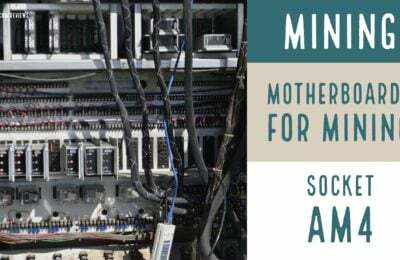 We didn’t expect a wall charger to be included in the box, a micro-USB cable, yes! I liked the 10 cm high tripod provided in the box. The soft plastic comes with a firm grip and can easily be placed on different surfaces to take videos, pictures or even timelapses. During our testing for the Eken V8s Action Camera Review, we found everything to be flawless once all the settings are in place. There are only three buttons on the device which is two less when compared with the cheaper Eken H9. Now, this brings us to the topic of menu navigation of the Eken V8s. Unlike the Eken H9, the V8s does not have the menu navigation buttons. It makes the menu navigation tricky to use, especially for someone who has not used an action camera before. For changing the settings, you will need to press the “Mode” button multiple times to get into the menu. The time-lapse video intervals supported are 500ms/1/2/3/4/5/10/15/20/30/60 seconds. The time-lapse photo settings are 3/5/10/30 seconds. You can change the exposure settings manually, between +-0/ +-0.3/ 0.7/ -1.0/ -1.3/ -1.7/ -2.0 which we think should cover all scenarios. We found the video quality to be much superior to the Eken H9, both in shooting 4K and 1080p full HD scenes. The EIS came in handy to remove the camera shakes while shooting videos. However, do keep in mind that the 170° wide-angle view is reduced to just 100° with EIS on. 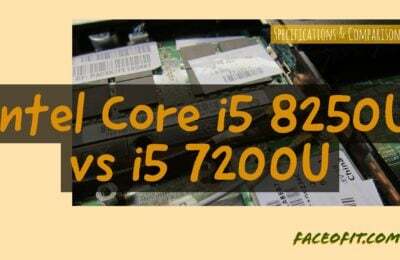 We did find the videos to be soft and lacked sharpness. 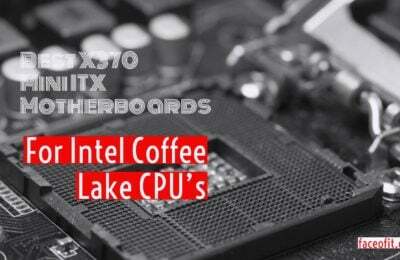 There is a lot of video processing being done by the chipset, and we feel a firmware upgrade should solve this issue. The V8s does come with dual-microphones for sound recording. Even though, sound recording is not a necessity for shooting action sequences or sports, it does have some use-cases. We found the sound quality of the Eken V8s a bit distorted when capturing high pitched sounds. Regular voice conversations in a relatively quiter environment was captured accuretely. 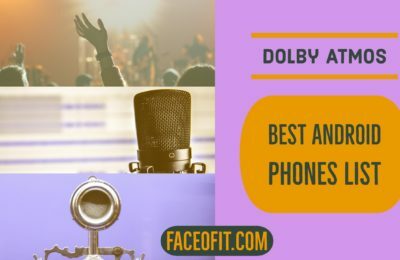 The device does not support any external microphones, so we guess all the sound work needs to be done in post-processing. Overall, the sound quality is average. 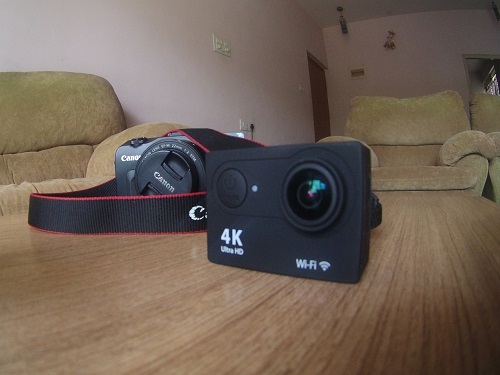 Overall, if you want a great action camera at an affordable price, you should go with this camera. The generous bundle that comes in the box should be more an enough for beginners. We also wanted to thank Eken for providing us with the camera for our evaluation. Thank you! 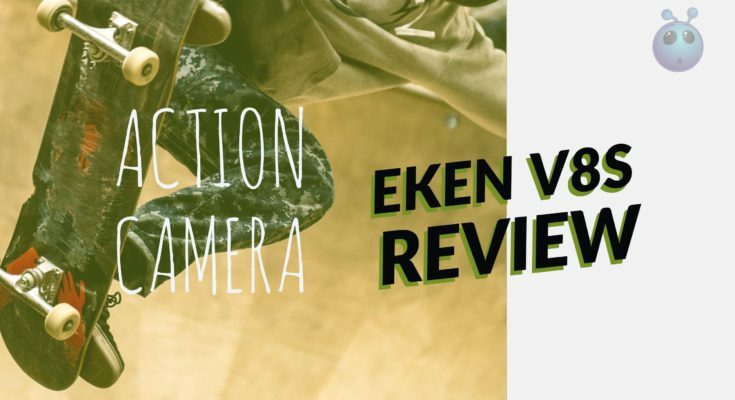 We hope you like our Eken V8s Action Camera Review. Suggestions and feedbacks are welcome in the comment section down below.